Conservation of Leucojum aestivum, a wetland-dependent species distributed in Europe and west Asia, should aim to reduce the fragmentation of wild stands, through the establishment of new populations. However, density-dependent dynamics occur in L. a estivum. For instance, fruit set and seed set increase with increasing plant density. In this study, we evaluate the effect of plant density on translocation success of two recently established populations of L. a estivum. 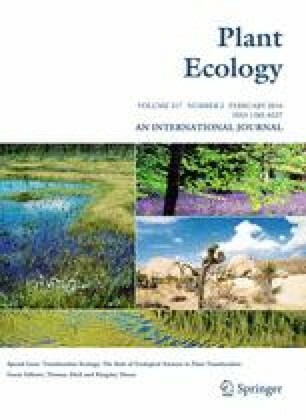 Twenty-six populations of L. a estivum were investigated in northern Italy to find out differences in population traits (size, density, age structure, and reproductive performance) between populations from different habitats. Data obtained were used to establish two new populations of the species differing for population density (high H, mirroring the typical plant density of a wild population in Salix alba woods and low L, in which plant density was halved compared to H), to evaluate the role of density-dependent dynamics on the translocation success. 4 years after the translocation, H produced seedlings, while L did not. Moreover, H produced a significantly higher number of fruits per fruiting plant and higher fruit set. Seed set was also greater in H than in L, while mortality was greater in L than in H, but differences were not significant. Our results suggest that population density is an important factor to account for in newly established populations, especially in those species showing density-dependent population dynamics. Moreover, the imitation of successful within-population dynamics occurring in natural stable populations may increase the translocation success. Communicated by Dr. Thomas Abeli and Prof. Kingsley Dixon. The online version of this article (doi: 10.1007/s11258-015-0529-x) contains supplementary material, which is available to authorized users.